If your object is going to have any texture image at all in your Farming Simulator mod, it really should be a diffuse map. Even window materials support having a diffuse texture, rather than just adjusting color and transparency sliders. To create diffuse maps on 3D models, you can lay down the groundwork in 3D and then paint details in a 2D program like Photoshop, Paint.NET, or GIMP. Some people prefer to do the whole painting process in 3D and the available tools for doing so have matured quite a bit. In fact, depending on the 3D format, even Photoshop will allow you to paint directly on 3D objects. If you have the ability to paint in 3D and prefer to work that way, refer to your software documentation for details. As you become more advanced, you can easily switch between techniques to fit the situation. 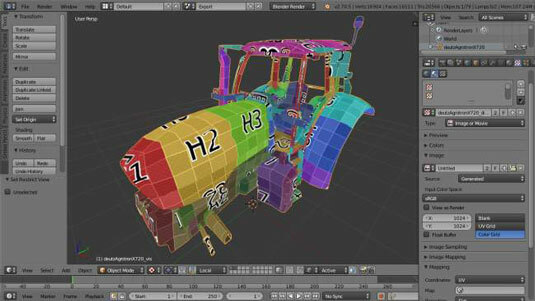 Here, Blender is used as the primary 3D tool, but the same basic process works in other major software as well. Hide all objects other than the one you want to paint. The quick way to do that would be to select your desired object and press Numpad-slash (/) to enter Local View. Chances are good that when you do so, you also end up hiding your lamp, so your model goes back to being a black blob when looking at it with Textured Viewport Shading (Alt+Z). Not to worry, you don’t need the light for this step. Instead, select your object, go to the Shading panel in Material Properties, and enable the Shadeless checkbox. Doing so kills any highlights and shadows on your model, but it also ensures that your texture is completely visible. From Texture Properties, select the first texture slot and click the New button below the list box. When doing this step, make sure you see material textures and not world or brush textures. After clicking New, the rest of Texture Properties fills in with a bunch of additional panels. Name your texture using GIANTS convention (for example, myFantasticMod_diffuse). Get in the habit of naming things and stay in the habit. Change the texture type to Image or Movie. New textures default to being Clouds. You want an image. In the Image panel, click the New button. Name: Use the same name as your texture (for example, myFantasticMod_diffuse). Width/Height: You need to pick these values now. There are a few optimal ways to do it, but for now just set it to the largest size GIANTS Engine can use (2,048×2,048 pixels). You can always resize the image later. Color: This value sets the base color for the texture. Alpha: If your texture requires transparency (like a window), enable this checkbox. Otherwise, you can disable it. Generated Type: The default here is Blank, which works fine, but you can use the Color Grid type. It gives you a visual reference so you know where on the 2D texture you’re painting. It’s all getting painted over anyway, so prepopulating your pixels with something useful doesn’t hurt. 32-bit Float: This option is for textures that require a lot of color precision. Because those textures aren’t typically used in games, go ahead and leave this checkbox disabled. In the Mapping panel, change the Coordinates drop-down menu from Generated to UV. This step ensures that your new texture uses the UV coordinates from your unwrap process. With your texture unwrapped, it’s a good idea to switch to a screen layout that better facilitates painting. You can work from the UV Editing screen layout (from the Default layout, press Ctrl+Right Arrow four times or just use the Screens drop-down menu at the top of the Blender window). You have the texture assigned to your object’s material, but you also need to make the association in a way that Blender’s texture painting system understands. In the UV/Image Editor, use the image datablock drop-down menu to choose the new image you created. Tab back into Object mode. You’re ready to paint, but before doing so, save this image to an external PNG file before starting (Image→Save as Image from the UV/Image Editor’s header menu). As it currently stands, Blender still thinks that this image is automatically generated, not something that you intend on manually editing. By saving it to an external file, Blender understands that the image is editable. And more importantly, you remember that you need to regularly save this image as you work.